Toastmasters Speeches: The Sales Training Speech-Sample, "Curb Appeal"
Beautiful house? But that is just partially true, because the house itself is not really extraordinary. It’s a simple two-storey house with 3-bedrooms and a small garage – nothing spectacular. Actually, there are bigger and more beautiful houses nearby. But still, yes, that’s the common remark. People who pass by say it’s a beautiful house. Look closely though. Would you agree it’s really the garden of flowers and ornamental plants in front that’s making a difference? It is what adds to the house’s attractiveness called its ‘Curb Appeal’. The phrase ‘Curb Appeal’ is well known among real estate agents and realtors and is defined as the attractiveness of the exterior of a residential property as viewed from the street. Hence the word ‘curb’ or the edge between a sidewalk and the street. As an ornamental garden plant grower and seller for the past couple of years, I have discovered that many past customers ornamental garden plants as a means to enhance their houses’ curb appeal. 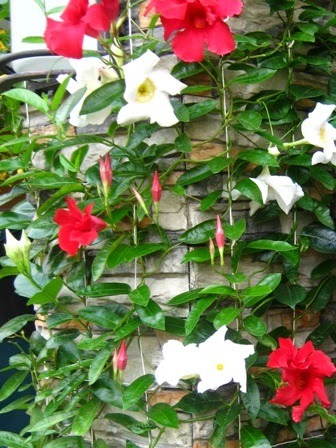 They buy flowering plants that they actually liked and consider landscaping as a DIY or do-it-yourself activity. Friends, gardeners and flower lovers, lend me your ears! For in the next 15 to 20 minutes, you will learn effective techniques for selling your ornamental garden plants – whether they are flowering vines, shrubs, or shade plants. Let’s go to the first step, build trust and rapport. Trust, ultimately, is the driver behind your ability to sell effectively. In many cases, if customers trust you, they will volunteer vital information or ask your advice in helping them reach a decision. Vital information from them is important for you to find what their needs are. To build trust, you also need to readily volunteer information about your products and services. Make yourself accessible. I remember a customer of mine, who came all the way from Diliman, Quezon City. Apparently, this customer was looking for a particular plant. 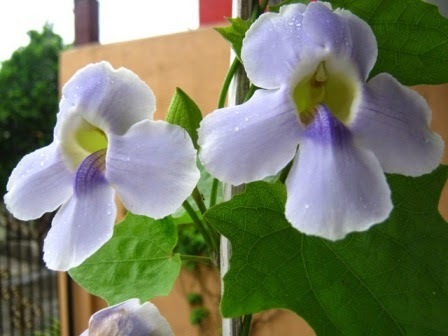 The plant is called Thunbergia grandiflora. But to gain trust, I needed to make myself accessible to her and so I sent her email, contact numbers and a location map so she can reach me. She found my Facebook page and found other plants there that interested her. We finally met and she didn’t buy one grandiflora seedling. No, she bought ALL five seedlings that I had. Building rapport means finding common interests between you and your prospective customer. Sometimes you learn a few just from facebook. Ask questions about their hobbies and interests and later you find much more in common than you thought. In most cases, it can lead to the customer liking you at least on a personal level. Building rapport helps in building trust. Now since we’re in the subject of social media like Facebook. Let me say one thing. Facebook is a very powerful tool for marketing your ornamental garden plants. But use it wisely. Be professional enough. Be truthful. Here’s a story that didn't turn out well for one plant seller that I know. Let’s call him Seller#1. Seller 1 has an extensive collection of Hoyas. He posts pictures of his Hoya collection on Facebook. The pictures are magnificent! Now I have a customer, let’s call him Customer B, who comes to me asked if I had a Hoya plant. I said ‘yes’, but I only have one variety. He looks at it and wasn’t impressed. He asked why the flowers are so small. I said ‘That is the regular size of Hoya flowers’. And then he talked about the Hoya collection of Seller 1. And I agreed that Seller 1 has a beautiful and extensive collection of Hoya plants. But later on, before he left, Customer B confided in me that he was cancelling his orders from Seller 1. I asked Customer B why and then he told me that he was dismayed to find that Hoya flowers were so small. He didn’t expect them to be that small. And you know why? The photos that Seller 1 posted had no indication how big or small the Hoya flowers were. (show Hoya picture again). This is a closeup picture. This picture shows the Hoya umbel as 5-inches across. In reality, Hoya umbels are only 2 to 3 inches in diameter. Customer B didn’t want Hoya plants anymore and canceled his orders from Seller 1. Of course Seller 1 was furious. Sadly, it was a lose-lose situation, not a win-win situation. Customer B didn’t get what he wanted and felt misled. And Seller 1 lost a potential sale. To avoid misunderstanding, here’s a TIP when posting pictures of your ornamental garden plants on the internet. When posting pictures of your ornamental garden plants, show size comparison. Just by looking, you will know that the flowers themselves are just as big as the person’s fingernail, and the clusters are probably as long as a finger. 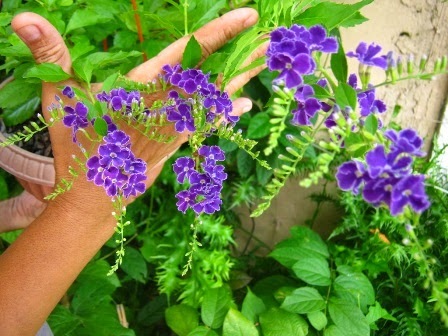 This compares the flowers with a person’s hand. But you can use other objects too for size comparison. You can put a ballpen or pencil or a softdrink bottle in the picture. That way, there is a point of reference. Truth in advertising to build trust and rapport. So that’s the first step, Build Trust and Rapport. The second step is to DISCOVER NEEDS. Customer needs are much easier to discover once trust and rapport have been established. Would you agree? By developing the first step of the process, it makes the subsequent steps relatively easy. For some customers, their needs are fairly straightforward. Like Customer A for instance, she already knew what she wanted, she was on a quest to find Grandiflora vines and she found them in my blog. Her quest ended after buying all my Grandiflora seedlings. In general, many customers say what they like when you ask them. But for some customers, it’s not as easy to extricate what’s on their mind. Take Customer B, for example. Customer B came all the way from Cavite and said he just wanted to look-and-see while he was there in the area. I said, ‘Go Ahead’. But sometimes you can pick up from their gestures and body movements. Customer B skipped our bougainvilleas, gumamelas and adeniums, the common ornamental garden plants, and I concluded he was looking for something different or uncommon. And so I asked him. True enough, he was amazed that the flowers indeed smelled like chocolate or vanilla. So he bought one mature plant with plenty of flowers. 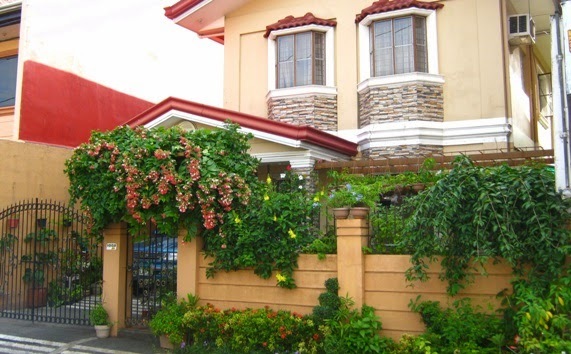 Later, I also learned that he had a resort house in Cavite and he wanted to do his own landscaping and was looking for uncommon but beautiful flowering plants. And then I showed him this (show Blue Butterfly bush picture). It is the Blue Butterfly bush, scientific name Clerodendrum ugandense. It has flowers that look like blue butterflies. He didn’t buy one. He bought three! He was excited. So that’s step number 2. Discover the Customers’ needs. Ask probing questions if you have to. Now let’s go to the third step. But just to recap, the first step is… Build Trust and Rapport. The second step is... Discover the Needs. The third step is to MANAGE OBJECTIONS. How do you overcome objections when there customers so negative, they can’t seem to be satisfied with what you offer. Don’t give up easily. A ‘No’ is not the end. It is just a temporary setback. Probe some more. Many times, customers object simply because they don’t have enough information to make a decision. The natural response of any person lacking information is to reject the idea or product. I’ll give you a good example. For instance you want to buy alarm clocks as gifts for instance. So, for instance you go to Divisoria where you can buy them cheap. So you go to a store and ask the saleslady. They have one on stock. You ask the saleslady to test it and make a demo for you. The saleslady scratches her head and attempts to turn some knobs and switches and the alarm clock hands don’t move. If they don’t move how do you test the clock or the alarm? She still scratches her head. You don’t want to spend your time in that store, do you? You reject it. Maybe you go to the next store. If customers don’t get enough information about a product or idea, they reject the product - and move on. 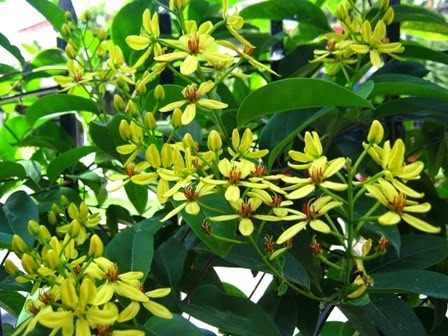 It doesn’t have a scent but the flowers look like yellow roses. 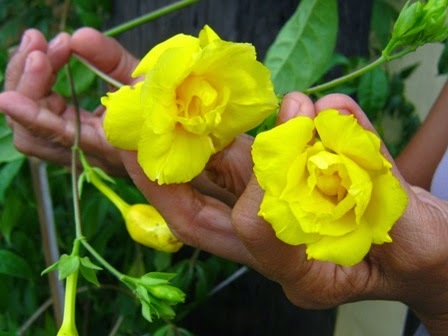 It is actually a variety of the common yellow bell. She likes it but complains that she doesn’t have a big front yard for that plant. I even showed Customer C how to put up the wires, or in the absence of wires, you could use bamboo rods or sticks. This is where your knowledge of growing ornamental garden plants can add value to the plants you’re selling. Customers appreciate this value-added service. So this is how you manage or overcome objections. Notice that steps 2 and 3 are iterative and can actually be joined together as a single step. The fourth step is to CLOSE THE SALE. Sadly for some, it is the only important part of the buyer-seller relationship. Not true. All four steps are important if you truly are a professional in your dealings with your customers. But having said that, if you manage to reach this point, thank your lucky stars. By this time, you have brought out the ornamental garden plants that the customer has chosen and ready to be loaded to the truck or car or van. But wait, be sure to close the sale strongly. Learn to capitalize on the interest that has been created. You know it’s there. Capitalize on it. Remember Customer A when she chose to buy all the 5 grandiflora seedlings instead of just one? You know why that happened? Well I learned that her front yard had a pergola and a garden arch. I said why don’t you put more vines so the pergola and arch will fill out easily and create shade? And then she had an idea! Customer A said that next year, she was hosting her class reunion and relished the idea that her vines will be shading her front yard and will be full of flowers! Her batchmates will be thrilled to see her garden, she said. There you go, curb appeal! How about Customer B. Remember he bought 3 Blue butterfly bush plants rather than one? That’s because I told him that putting just one plant there wouldn’t have much of an impact if he wanted to showcase his garden to his visitors at the resort house. Sure, he could propagate the one plant, but why wait when the 3 plants will be flowering quickly. Again, curb appeal! And lastly, here’s a tip. After a successful sale, offer a freebie to your customer. You know this too well. Even car dealerships have them. When you buy a car, they offer floor mats or car covers as freebies. This freebie, it's a small gesture. But this gesture creates goodwill and seals the trust and rapport that you have built with your customer. There you have it. The four steps towards successful selling of ornamental garden plants. Friends, gardeners and flower lovers. Growing ornamental garden plants can be extremely rewarding. Being able to sell them to customers is an added bonus. Financial rewards are there if you are patient, consistent and determined. Follow the 4 steps in selling your ornamental garden plants and help your customers build and enhance that Curb Appeal in their homes.